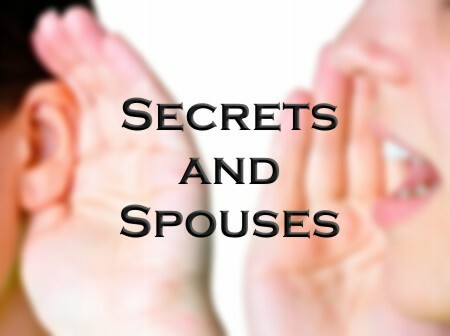 Do you think its okay to keep secrets from your spouse? Here’s a Bible study on this question. The Bible is not very flattering to us as it says “God is not man, that he should lie, or a son of man, that he should change his mind. Has he said, and will he not do it? Or has he spoken, and will he not fulfill it” (Num 23:19), in fact, it is “by two unchangeable things, in which it is impossible for God to lie, we who have fled for refuge might have strong encouragement to hold fast to the hope set before us” (Heb 6:18), so “Let God be true though every one were a liar, as it is written, “That you may be justified in your words, and prevail when you are judged” (Rom 3:4). I know this sounds harsh, but what human that has ever lived has not ever lied? If someone says that they’ve never lied, then they’ve just proven that they are a liar. We all are, and only God cannot lie because it is contrary to His own nature. Do you agree that you are a liar too? Is it true that we are all liars? What does that do to your ego? Are there times when it’s okay to lie to your spouse? As we have read, all of us are liars, not meaning that we lie all the time, but human nature is often too strong and we lie in order to make ourselves look better and lie in order to look better than others. We even lie to cover up our sins or mistakes, which only serves to make it worse. The Apostle Paul is like the rest of us that “I do not do the good I want, but the evil I do not want is what I keep on doing” (Rom 7:19). It’s as if we can’t help ourselves. The ninth commandment says, “You shall not bear false witness against your neighbor” (Ex 20:16), and God would have never made such a command if He knew that this was not in our nature to lie, but lie we do. He also wouldn’t have made such a command to obey if He didn’t expect us to keep it. Even though we lie, we know that the blood of the Lamb of God covers all of our sins, including our lies, but this doesn’t excuse our lying to one another. In fact, lies not only hurt others, they hurt the person who is telling them. Lying is nothing short of cosmic treason against God, so clearly, we are told not to lie, but what about lying to a spouse? What about lying to cover up something that happened years ago or just yesterday? Is it true that “What they don’t know won’t hurt them?” Absolutely not. Lying is never justified in any way. Does it take humility to confess to a lie? Is lying okay in some cases? When Rahab lied to save the lives of the spies in Jericho, there is never any rebuke from God or the spies about her lying. In fact, Rahab ends up in the so-called Hall of Faith in Hebrews 11 where it says “By faith Rahab the prostitute did not perish with those who were disobedient, because she had given a friendly welcome to the spies” (Heb 11:31). God saw this as welcoming the spies, not lying to protect their lives. If God was going to call Rahab a liar, here was His chance, but instead He says, “she had given a friendly welcome to the spies” and didn’t want them to be discovered, or else they would’ve died, but of course lying is wrong almost every other time, however, suppose you were in Nazi Germany and you were hiding Jews from the Nazi’s and if they discovered them, they’d be murdered? Would you think it’s better to tell the truth and let these Jews die, or would it be less of a sin to lie so that they wouldn’t be murdered? If I had a choice, I would lie to save lives. Dr. R.C. Sproul once said that those who deserve the truth should receive it, but those who don’t, shouldn’t. What he means is, if someone has a diabolical plan to kill someone and you have it within your power to save their life by lying, wouldn’t you do it? Knowing that God will forgive this lie, especially considering why you lied, don’t you think a lie would be justified? These are very difficult questions, but what about a spouse? Is this the same situation? Are there times when it’s okay to lie to your spouse? Did Rahab sin by telling a lie about the whereabouts of the spies? Are there exceptions to telling a lie? When a couple is dating and then becomes engaged, there should be no secrets from the past that have not been brought to the surface. This doesn’t mean we have to confess every single sin we did before we ever met our spouse or fiancé. What it does mean is that if we’ve been married before, or we’ve had an affair prior to becoming engaged, it is better to get this out into the open than to have this discovered after they’re married and then one of the spouses feel betrayed. Some things are better left unsaid, but those things that deal with serious sins, like sexual immorality, or having had an abortion, would be better off being brought out and talked about, rather than being discovered after the fact and having these cover ups come back to haunt them. Ungodly marriage counselors will often say that lying is okay in many circumstances, and I don’t mean circumstances that are a matter of life or death. These men and women who don’t have the truth think that the truth is overrated and isn’t that big of a deal to lie, but try telling that to a spouse that’s been lied to or have covered up some serious sins from the past or even in their present marriage only to have them discovered. Lying does no one any good in such cases. I can’t see any reason to justify lying in marriage. Transparency and trust should be the foundations of a marriage, because without trust, you have nothing. Why does it harm a marriage to keep secrets? What are some things that we don’t have to worry about telling our spouse? What are some things that we should tell our spouse? I believe honesty is not just the best policy; it’s the right thing to do, because when we lie to our spouse, we are undermining the very foundation of our marriage, and that is trust. It takes only 1 minute to undo years of trust. If you’re hiding something for the right reasons, like planning a second honeymoon or a surprise birthday party, that’s not really lying by keeping it secret. Let me say that there should be no secrets in a marriage except those things that are going to be used to make someone very happy. How would you feel if you knew someone had lied to you or was lying to you on a regular basis? What would that do to your relationship with them? Would it be hard for you to trust them again? Think about others the next time you’re tempted to lie, because even though the truth might hurt, a lie hurts even more…especially when it’s discovered. Why does a lie hurt others? Why does lying hurt the person telling it? Are keeping some secrets okay? “Keeping secrets” is a bit different from lying or being dishonest. For example, if a husband is planning a surprise birthday party for his wife, that’s a “secret” that’s being kept. How does that fit into what you wrote, Jack? That is a great exception. I guess that’s how that fits in Joe. So good to hear from you my friend. Hope all is well. My husband had an affair and married his mistress. They had a secret marriage and bore a child which was also kept secret. My husband had this double family set up for 9 years. The last 9 years of our marriage. He died in November 2016. My husband was not the type of man whom you could ask if his whereabouts. He went on alot of business trips or would say I’m away for a couple of days. I never asked why or he would tell me he was going to a friends wedding abroad. This woman always accompanied him. I never knew she existed or the child until after his death. He had met her just the day before. Does this constitute lying? He met her thousands of times under my very nose in my own home town and actually visited her every night when I went to bed. Is this lying or hiding? Hello Mrs. Alam. If your husband is dead, why do you want to keep wondering if he was lying now? It is over, isn’t it, with your husband dead? I would say it is lying and cheating, but since he is deceased, you must forgive him and move on with your life. I would speak with your pastor about this. Previous post: What Does The Bible Say About The Ocean?